Intuitive eating takes us right back to the very roots of eating, it’s a natural way of eating and one which can hugely benefit our health. There are 3 simple things to remember when it comes to Intuitive Eating. Only eat to satisfy hunger. Stop eating when you have had enough food and feel full. No food is “bad” food. There are 10 principales of intuitive eating which are spoken about by many intuitive eating coaches and are mentioned in the book Intuitive Eating. These are pretty simple and when applied consistently can totally change our relationship with food, our enjoyment at meal and snack times and our eating habits. Discard diets all together. Whilst there’s a niggling part of us that desperately wants to hold onto the hope that there IS a set diet out there that will work for us in the long term, we have to accept that there really isn’t. Short term diets can quickly give us the results we desire however long term that really isn’t the case. Research has shown that even those attending Weight Watchers and Slimming World aren’t likely to lose weight. 60% of people don’t lose a significant amount of weight at all and the 40% who do, all put on that weight again and more within five years. Honour Your Hunger. In order to eat intuitively we must honour our hunger levels. We need to think about how we can avoid getting to a point of intense hunger. Are we having a balanced breakfast which provides us with enough energy? Do we need a snack mid-morning? When we reach those intense hunger levels, our primal instinct kicks in and any thoughts of eating intuitively or consciously fly out of the window. We just want to eat fullstop. Make Peace With Food. Intuitive eating requires us to give ourselves complete permission to eat whatever we feel like eating. When we deprive ourselves of a certain food because we have come to think of it as “bad” or “unhealthy” our cravings become more frequent, when we eventually eat the food it’s often eaten ravenously without much enjoyment at all and we’re left with intense feelings of guilt. That doesn’t sound like much fun at all does it? Challenge The Food Police In Our Minds. We have to let go of food labels such as “good” and “bad”, “healthy”, “unhealthy”, “guilty pleasure” and even words such as “clean eating” “organic”. Respect Your Fullness. This involves checking in whilst we’re eating, enjoying our food mindfully and watching out for the signals our body gives us that we’re full. Discover The Satisfaction Factor. Studies have shown that when we enjoy the food we’re eating we require less of it to feel full. Eating yummy food that makes us feel good really can work wonders. Honour Your Feelings Without Using Food. I’m not saying that emotional eating is necessarily a bad thing, it’s a comfort to so many of us, however we must realise that whatever has caused us to eat, will still affect us once we have finished whatever food we’re desperately using as a distraction or to numb our emotions. Respect Your Body. This is a huge block for so many of us, but respecting and learning to love our body goes hand in hand with intuitive eating. Would you try to squeeze your foot into a size 4 shoe if you were a size 7? I don’t think so! Exercise. Rather than calling it exercise, I prefer the term Joyful Movement. I believe we need to steer away from exercising to lose weight and focus on how it makes us feel. Honour Your Health. Above all, progress over perfection. Don’t worry if you realise you’ve hastily eaten something because you felt angry or sad. Don’t fret if the food police come out in full force in your mind, all that matters is that you’re making progress. At first that progress will be creating an awareness around food, eating habits and thought patterns. Eventually new habits, tools and coaching will enable you to eat intuitively and find happiness with eating and food. Remember: no food eaten just once can cause a nutrient deficiency, enable weight gain or weight loss. No food is good or bad. Food is just food. 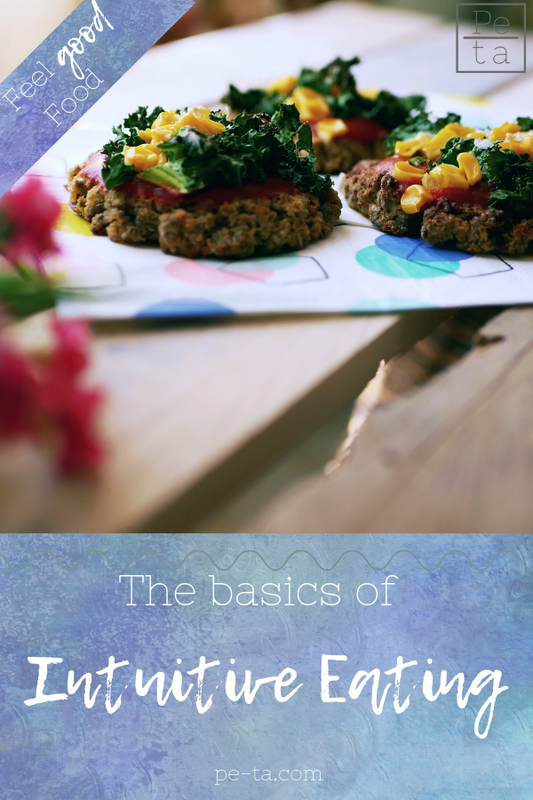 I hope you find these intuitive eating principles helpful. I’d love to know if you already use some of them and which you’d like to add to your happy eating habits. If you're new to intuitive eating, consider trying one step at a time. When we are implementing new habits we can often fall at the first hurdle, if it’s too complex too quickly, the habits won’t stick. We need to build up in small steps. Finding happiness with eating and the food that makes you feel good takes time, but it lasts a lifetime. If you would like to delve into eating coaching further you can work with me on a one to one basis, find out more here.